· Initially we noticed his loss of balance and a slight head tilt. 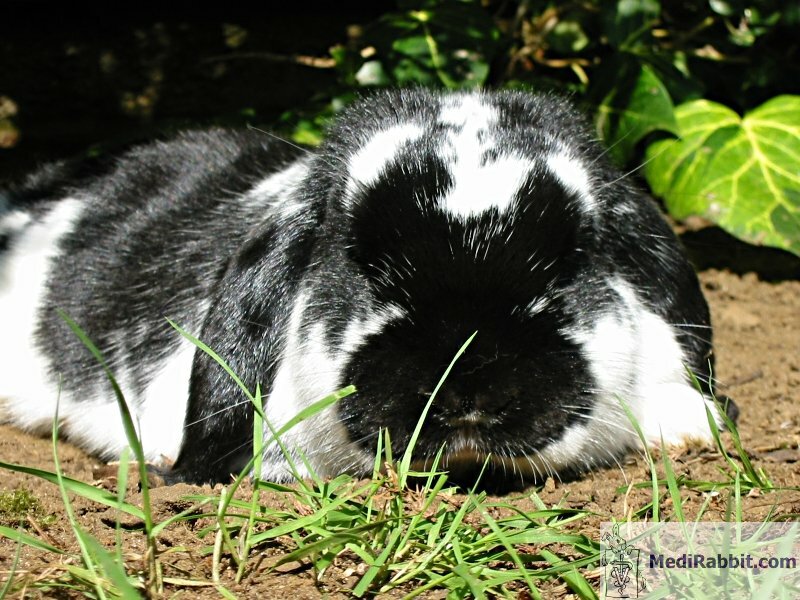 · We visited our "rabbit savvy" veterinarian to seek help and Starsky was treated with antibiotics (Baytril) and albendazole. He was kept over in the hospital for 2/3 nights to conduct further tests (titer for EC) and monitor his condition. · He appeared to have recovered pretty well and returned home, the titer for EC was positive hence we continued treatment with albendazole. · After a couple more days at home, one night he had a dramatic relapse with far worse imbalance and head tilt. He was again admitted to veterinary hospital where his condition rapidly worsened, he developed a severe and regular "corkscrew" fit. His entire body would rotate violently and if not restrained he would just roll and roll indefinitely and was likely to damage himself. · He was taken back to the veterinary hospital where he was kept restrained in a small wire cage lined with towels that enable minimal movement such that the violent "corkscrew" fits would not cause him serious physical injury. At admission this time he was given a course of steroid injections, the albendazole treatment was continued and occasional administering of meloxicam (Metacam, pain relief) during periods of perceived acute discomfort. · After several days there was no perceivable improvement and the veterinary hospital had no further treatment suggestions. The stark reality was that we took Starsky home, fully expecting to give him a few more days "chance" and a last goodbye to his partner Hazel before taking him to our local veterinary to euthanize him. · During those days we started searching the web about this disease about which only just over a week earlier we had been totally unaware. It was at this point that we came across the MediRabbit website and the pyrimethamine treatment. 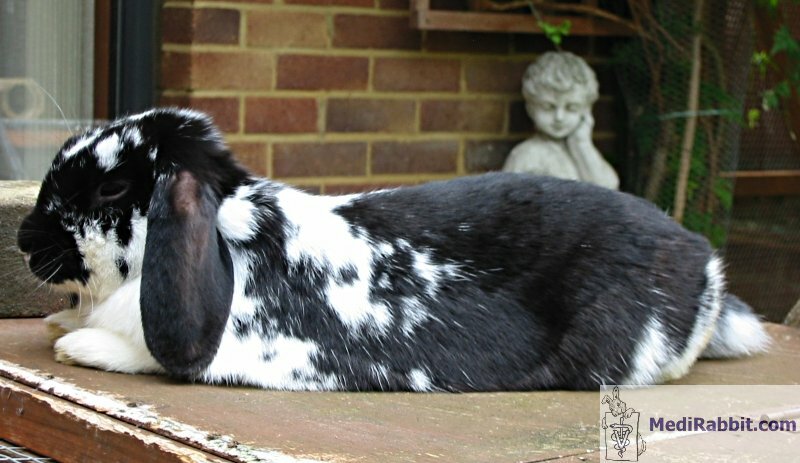 · We approached our "rabbit savvy" veterinarian and asked him what he thought of this. Being South African, he was very familiar with the use of pyrimethamine as an anti malarial, he immediately understood the logic of using pyrimethamine and agreed to do what he could to support the treatment. · So, we progressed pretty much as suggested, also continuing with albendazole, plus metoclopramide (appetite stimulant) and occasional use of Rescue Remedy (calming influence) and Sea Legs/Dramamine (reduce sickness, increase appetite) when considered appropriate. · First very small signs of improvement came after a few days. Less frequent and less violent fitting, slight improvement in head tilt, apparent greater willingness to feed and groom. · For 10 nights I slept with my arm across Starsky in his small wire "prison" so that I could sense when he fitted, restrain him and prevent him damaging himself. Fortunately I worked mainly from home at that time and was also able to provide very regular attention and feeding during the day too, we tried to mainly keep his small wire cage inside his hutch/run complex where he could at least retain the stimulation of having his partner Hazel around him. · After the first small signs of improvements as previously mentioned, the recovery steadily continued. After 17 days there was a complete cessation of the "corkscrew" fitting and whilst the head tilt remained it was by then dramatically better. · The Fansidar (pyrimethamine and sulphadiazine) and Cytagon (folic acid) treatment was stopped after one month. Albendazole treatment was stopped after around 8 weeks. · The very last symptoms to disappear were general balance issues and the very last of the head tilt, this was after approximately 10 weeks of starting the pyrimethamine treatment. Since Starsky's EC experience, he has so far lived a further 5 years; he is now coming up for his 7th Birthday in October this year.